Emerald Bay Sunrise at Lake Tahoe. After recently adding a few new Emerald Bay photographs to my website, I realized that this special place deserved a Scott Shots online gallery of it's own. Emerald Bay in Lake Tahoe, with Fannette Island sitting right in the middle of it, is one of the most photographed places in the world, but it's not one of the easiest places to photograph. I've been out for plenty of sunrise and sunset photos there that end up being duds with no color. It can often be overcast creating more silver looking lake, not as pretty as the deep blue or emerald colors that can be there. Also, the steep mountains surrounding Emerald Bay can hide the sun early in the afternoon, causing the waters to loose their emerald color. Snow can cause the road to close due to avalanche danger in the winter. In the summer, traffic, tons of tourists, and boats can make it difficult to get a good photo as well. But, when everything works out, Emerald Bay can be a magical place that deserves to be on your must visit list. If you're going to shoot an Emerald Bay sunrise, dress warm pretty much all year. It can get pretty warm in the summer months but it can get cold quickly again in the evening. There are plenty of place to shoot from along the road and designated vista areas but there are also some great place to shoot from above Eagle Falls. Even though the best places to shoot above Eagle Falls are only a few dozen steps from the road, they can be dangerous steps. Slippery rocks, small stream crossings, and ice can demand your hiking boots. Despite the crowds that can form, this isn't Disneyland, there is nothing preventing you from falling off large cliffs if you slip too close to the edge. Emerald Bay Sunrise photographed from above Eagle Falls. I usually bring my fully packed big Lowepro bag with 2 camera bodies and multiple lenses but I usually just use my 24-105mm or my 17-40mm wide angle lens. If you're looking to zoom in on Fannette Island only, you'll want a more powerful telephoto lens. I find I always use my tripod at Emerald Bay except for a couple photos I shot from a small boat. If you have any questions about photographing Emerald Bay, Lake Tahoe, please ask/comment below. More information about visiting can be found at the California State Parks website. Also, please enjoy this slideshow of more Emerald Bay photographs. Click on any of the above images to view more information. Available as fine art prints, gift items, and as stock photography. Scott Shots Photography now exhibiting at Fancy That in Marin, CA. "Beauty at the Bottom: Red Wine 2" - on exhibit at Fancy That. It's official. Yesterday I drove to San Francisco and dropped off a bunch of my Scott Shots Photography prints to exhibit and sell at Fancy That in Marin. They are "The Place in Marin for Arts, Gifts and Accessories" and are located at The Market Place at Tamal Vista in Corte Madera. I'm excited to have another location carrying my work, and I'm especially excited to now have a Bay area presence. People have been telling me for years that I need to be selling my "Beauty at the Bottom" photos in the Bay area and that is exactly what they are exhibiting. There are also a few of my Tahoe area landscape photos available. Fancy That is carrying mostly 8"x10"s but a couple framed 16"x20"s are on exhibit and for sale as well. Fancy That will also take orders of any size prints that are printed by me, from 8"X10" to 30"x40". They will be selling the prints for the same price that I do on my website but you don't have to pay shipping and you get to see the prints in person before you buy. If you stop by Fancy That to check out my work, please let them know I sent you. Thank You! Event page on Facebook for more info - CLICK HERE. Scott Shot Skins now available for your iPhone, iPad, and laptops! New products were added to the Scott Shots website today. SKINS!!! 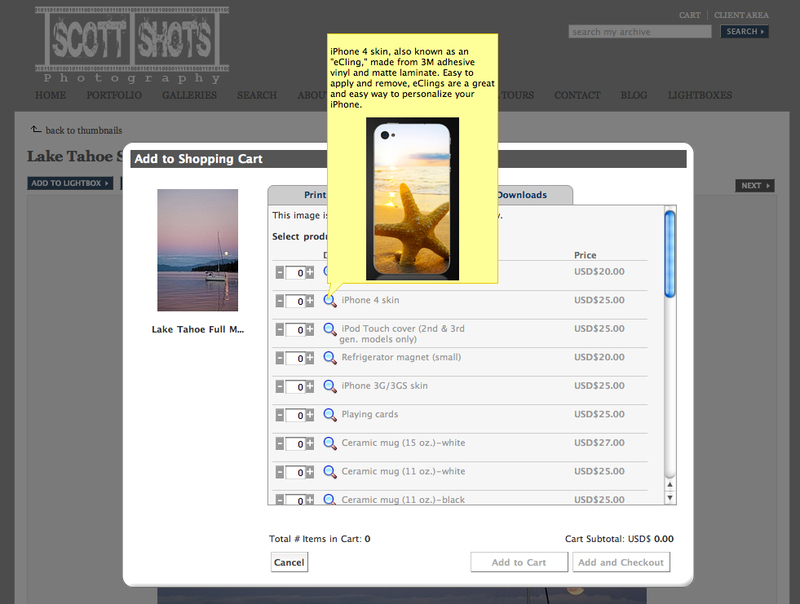 You can now decorate and personalize your iPhone, iPod, iPad, or laptop with a Scott Shots photo skin, also know an "eCling". They are made from 3M adhesive vinyl and matte laminate and they're easy to apply and remove. Screen capture of the Scott Shots Photography shopping cart. The price is $25 for iPhones and iPods; $35 for iPads, 15" and 17" laptops. Just find a fine art photo you like on my website (or a commercial photo I shot for you or your business), click "add to cart", click "products" and you will find the options and prices. You will be given the option to choose your crop, I would suggest doing this as the iphone and ipod skins are taller and skinnier than most of my images. I'm excited about this new edition to my photo product line, what are your thoughts on it?